As I was looking over my notes from the 4S/EASST conference in Barcelona to write this essay for the EASST Review, a post on the Facebook page of Nature caught my eye. With the title “Young, Talented and Fed-Up: Scientists Tell Their Stories,” the article focuses on the experiences of three young scientists, suggesting that young researchers today face unprecedented pressure to publish, gain funding and secure permanent positions (Powell 2016). Intrigued, I perused further and realized that the article that had first grabbed my attention was part of a special issue of Nature on young scientists – and the implications their working realities have on scientific production. That the two concerns are deeply interrelated is quite unceremoniously stated in the first line of the editorial of the special issue: “Academia is more difficult than ever for young scientists. That’s bad for them, and bad for science” (Nature 2016). Importantly, one of the reasons for this “badness” is the increasing understanding that the focus on the quantity over quality of scientific output may be detrimental to science as an enterprise that is supposed to tackle the world’s big questions. The narratives of the special issue of Nature could not have been more timely. In many ways, they give voice and legitimacy to the socio-economic uncertainties that many early career researchers around the world experience and try to navigate. It is also the topic that I have explored in my own dissertation work on young international scientists in contemporary Japan; focusing on the experience of the configuration of science, mobility and labor, I have suggested that, in the context of Japan, transnationally mobile researchers rely on cultural explanations in their attempts to make sense of the uncertainties embedded in global scientific labor regimes. The concerns of the Nature special issue also speak directly to the questions raised throughout the 4S/EASST conference track “Governing Excellent Science” and, importantly, some of the themes permeating the postgraduate workshop as well. That unpacking the quite elusive concept of research excellence is a topic of great interest for STS scholars is reflected in the fact that the “Governing Excellent Science” track brought together many researchers: four panels with four or five presentations in each of them. The conveners of the track successfully pinpointed and rendered visible an ongoing moment of transformations in research policies around the world – that of the policy makers’ increasing reliance on quantifiable indicators to evaluate research processes and scientific thought (Sørensen, Bloch & Young 2015). In addition, the presentations of the track participants highlighted how reliance on bibliometrics and other quantifiable measurements of scientific productivity and quality have been more and more incorporated in the evaluation structures of research institutions themselves, despite the unease with and critiques of this shift. The track addressed four major themes within the governance of excellence: funding for excellence, the excellence rhetoric, the management and evaluation of excellence, and the comparative aspects of research excellence. The presenters added flesh and inspiring nuance to these themes and inspired enlightening discussions: they examined a multiplicity of ways in which research processes and scientific outcomes are shaped by access to funding and mechanisms of evaluation; they highlighted the strategies scientists and administrators employ to navigate the excellence system; and they offered glimpses into the ways scientists “talk back” to the rhetoric of excellence. At the same time, however, the “Governing Excellent Science” track presentations seemed to every time underscore an argument Chandra Mukerji already made more than twenty-five years ago when addressing the relationship between scientists and the bodies governing science: “[t]he successful use of science by the state gives science a potential value so great that it cannot be ignored. But scientists are rarely given much power” (1989: 85; emphasis in original). While in many cases supra-national organizations such as the European Union have subsumed the role of the state and non-state actors such as private corporations have come to be increasingly influential, the point still stands: research policies shape scientific outcomes in particular ways, and scientific practitioners seem to have no other option than to comply or quit. The special issue of Nature which I brought up in the beginning of my reflection highlights the fact that this unilateral shaping is deemed problematic not only by early career researchers but also by scientific practitioners in positions of relative power, and that the number of discussions on the topic should increase. It also suggests that both scientists and social scientists researching scientific work aim to address similar questions (for instance, the uses of bibliometrics in assessing research excellence). It is for this reason that I suggest that STS examinations of research excellence would benefit from two simultaneous approaches: first, explicit acknowledgment that STS researchers are also affected by research excellence policies; and, second, a shift in the focus towards multi-faceted critiques of the excellence rhetoric with the goal of imagining its alternatives. To address my second point, I find it important that we offer multi-faceted critiques and imagine alternative futures. At a time when we – both as scholars of scientific production and as research workers ourselves – are provided with increasingly narrow definitions, operatializations, and indicators of research excellence, it is more crucial than ever to account for the interconnectedness of epistemic and social uncertainties (Sigl 2015). Reflecting my training in cultural anthropology, I suggest that this approach would imply turning an analytical eye to the examination of practices and affects, movements and desires, strategies and uncertainties of those who are enlisted to produce research excellence in different parts of the world and contexts of scientific production. Equally importantly, it calls for an exploration of practices of those who fail or refuse to meet the demanding conditions required by the rhetoric and structures of research excellence, as well as those who are actively involved in the search of alternatives. This approach would involve, as anthropologist Dominic Boyer has suggested, approaching scientists “not solely as rational(ist) creatures of expertise, but rather as desiring, relating, doubting, anxious, contentious, affective – in other words, as human subjects” (2008: 38). The Barcelona 2016 conference was my first experience of either EASST or 4S, and a welcome opportunity to get a sense of the breadth of STS research in different areas as well as themes that unify them. Against the background of a rich buzz of topics, presenters and tracks, which made planning each day an exciting but challenging task in itself, I also presented and participated in one full track, STS and Planning (T004). The track, as introduced by the convenors, was an opportunity to consider how planning can be explored by STS prisms of inquiry, for example considering the role of artefacts, different forms of knowledge, and centres of calculation. Hybrid approaches were strongly represented, particularly with planning being conceived of as a discipline that actively draws together and works with the material and the social in producing space. The aim, in the track’s description and as seen in the presentations, was not just to critique and open up ‘black boxes’, but to consider how planning could be ‘reassembled’ in a more diverse and reflexive manner. While not representative of all the papers presented, a major theme that crystallized in my reading of the track was the unpacking of how different types of knowledge are defined and understood when analysing planning processes. In particular, it appeared that certain types of knowledge, associated with certain actors, had a different influence on decision-making to what might have been expected. This played out on themes where STS has much to contribute, such as the role of calculation and calculative devices (e.g. Porter, 1996; Callon & Law, 2005) and interactions of expertise and lay knowledge (Epstein, 1995). In the session on standards, for example, Alan Lewis described use of the ‘daylight factor’ by architects, a mathematical calculation of daylight that was adopted to signify a design approach based on verifiable principles. Despite requirements to use the calculation, he showed that architects didn’t routinely do so. Instead, the calculation itself was separate to the meaning it represented, as it created an impression of mathematically verifiable principles in design while the individual knowledge of architects still determined outcomes. In my presentation on the adoption of environmental assessment methods for buildings by local authorities, I aimed to make a similar point on the disconnection between the calculation provided by standards and how they are used in and influence actual decision-making. This emphasised that the environmental assessment tool was adopted not just for the knowledge it generated, but for what it represented to decision-makers as a standardised tool. In this sense, when decision-making processes themselves were the focus of study, rationalist decision-making fuelled by calculative devices could be shown as a veneer, behind which decisions relied on other forms of knowledge. Other presentations spoke more explicitly about the involvement of different types of knowledge in the planning process. Looking at ecological controversies in Hong Kong, Anders Blok used the term ‘planning ecologies’ to consider how different publics interact and shift to challenge official planning practices, such as environmental groups suggesting new possibilities for river and floodwater management whilst up against a strong culture of engineering-based knowledge. Yvonne Rydin’s paper on planning hearings for an offshore wind farm in the UK showed how quite different types of modelled and personal knowledge on landscape and ecological values coexist in the decision-making process, opening up room for deliberation about the voices given to nature in planning. Isaac Marrero-Guillamon discussed the politics of participation in planning processes in a post-Olympic Games site in London, and charted how a particular group emerged as a respected site of communal expertise within that process, developing new categories of knowledge and influence within a particular representation of ‘the community’. Yet other presentations provided a more materially driven sense of knowing about urban space. Helena Leino discussed the results of research focusing on experiences of the visually impaired in urban spaces in Finland, and their interaction with other people and material elements. Pedro Ferreira discussed the process of ‘spot-making’ by skateboarders, with special attention to the distributed agency of different surface materials, humans and their environments in this particular form of city building. These specific experiences of space are likely often overlooked by planners but still influence the experience of broader publics. Fig. 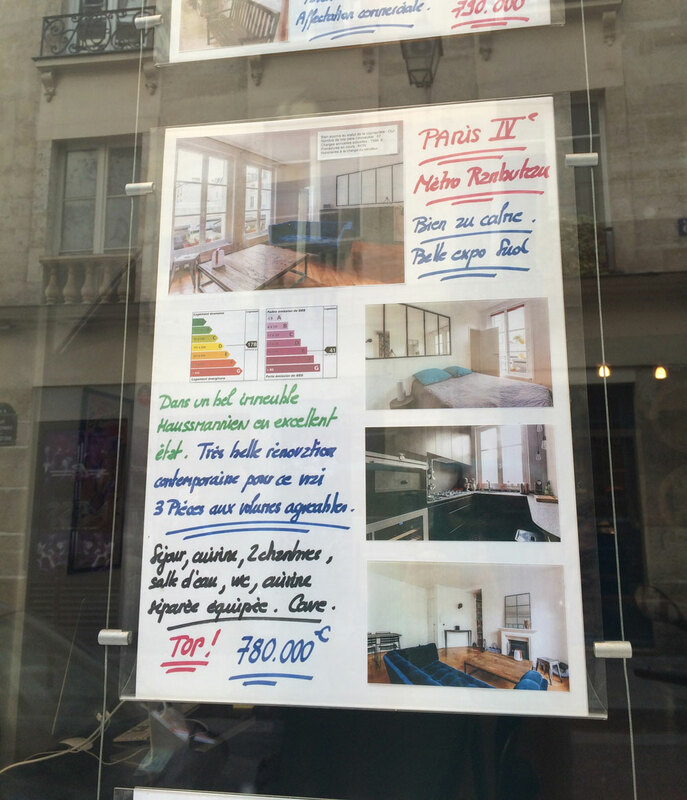 1: Energy performance standards in real estate listings in France. Looking at the meaning created by standards can open up space for understanding the different types of knowledge at play. While a rough brushstroke over the sources of different types of knowledge in planning, this led me to think that discussing planning ‘by other means’ (the conference theme) may contribute to rejecting a priori explanatory trajectories of how knowledge influences planning. It suggests that the knowledge brought by different groups (professionals, experts, communities) may influence planning processes in unexpected ways that are not usually associated with these labels. Moving away from the modernist idea of a single knowledge reflecting truth, planning theory has grappled with the presence of multiple ‘knowledges’ and ways of knowing that need to be mediated by planners. This brings with it challenges such as how to consider scientific expertise alongside localised knowledge (Rydin 2007) and how to define what it is for planners to ‘know’ and expand their knowledge base, when acknowledging that knowledge is represented by different types of cognitive, moral and skills-based learning (Davoudi 2015). The presentations in the track provided examples where otherwise accepted categories of knowledge, or typologies of knowledge, could be questioned, and even unravelled. As a result they challenged obvious explanatory dichotomies such as expert/lay, scientific/subjective etc. Rather than taking these categories of knowledge for granted, the ‘knowledges’ found in the papers were not easily categorised but instead mediated and established by other elements. Whether a scientific model (in the form of standards), community stakeholders (participatory planning), or expert judgement (planning hearings), in each case, these apparent types of knowledge were mobilised into these categories by artefacts, professional cultures and negotiations. In some cases, examining the way in which the knowledge was built up and used seemed to weaken the knowledge claim, unpacking scientific rationalities behind standards for example. In others, it suggested empowerment, showing how spaces for lay knowledge, communities, judgement and multiple voices are made within institutional arrangements, and how these can influence the very core of planning decisions, despite appearances to the contrary. An STS-led reading, which invites questions about how taken-for-granted knowledge is established, could invite more analysis on the types of knowledge discussed in planning, and how they are established and categorised in relation to particular groups. Another striking aspect of the track as a whole was its diversity, and what this signalled about what it is to discuss ‘planning’. There were sessions on planning and urban design standards; practices and operations; planning and ecological issues; and politics and participation. Some ethnographic presentations, such as by Pim Peters and Julio Paulos, brought the listeners up close to the daily practices of planners, and the meetings, discussions, interactions and practices that translate into their broader work. Marko Marskamp suggested a study of planning that decentres the planner from the process and focuses on planning tools such as codes as the object of research. Other presentations, such as by Anders Buch (with Anne Katrine Harders) and by Malve Jacobsen, emphasised that the implementation of plans is contingent on social practices, material infrastructures, discourses and ideas. Both of these highlighted the hybrid arrangements that fill the space between plans and their material implementation. As noted, there were also more material accounts of the interactions between particular users and the city and their voice within the planning process and city-making. I was left wondering what ‘planning’ represented to the different speakers, and whether there is a gap between examining the practice of planning, and examining how planning emerges, ‘in practice’, or whether they are one and the same. In the context of thinking about what planning is and what it is represented by (e.g Alexander 2016), this sparked my interest to consider what STS in planning can bring to this question. As a brand new PhD graduate, one month after the defence, I approached my first joint 4S/EASST meeting with a twofold feeling: the need to start reflecting seriously upon my doctoral research on the one hand, and a blend of curiosity and anxiety generated by the key question ‘what’s next?’ on the other. These two dispositions required me both to look back at the work done and to look ahead to find out job opportunities inside or outside of academia. In hindsight, I realized I tackled these interrelated preoccupations by attending two moments of the conference, that is the postgraduate workshop and the track titled “Considering the performativity of our own research practices” wherein I presented a contribution. I found my condition of “in-between-ness” (Anzaldúa, 1987), that of not being a PhD candidate anymore and the one of yet-to-being something else, interestingly depicted during these two different moments of the conference. 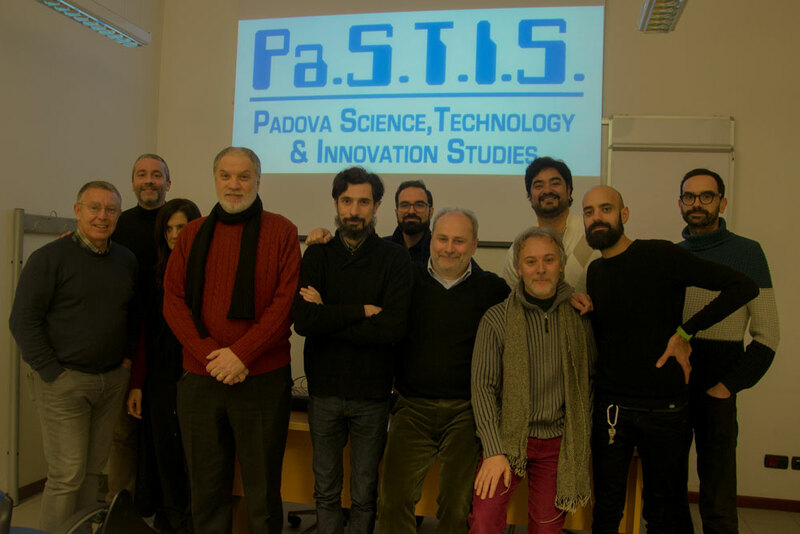 They have both confronted the challenging motto of the meeting — “Science and technology by other means” — by calling into question not just the non-traditional experiences and practices where science and technology are performed, but mainly the “other means” by which STS deals with its own epistemic practices. Indeed, the doctoral workshop invited graduate, postgraduate, and early-career scholars to reflect collaboratively upon new and unconventional research practices, publishing options, and careers. On the other hand, the track 014 — chaired by Juliane Jarke, Lisa Wood, and Lucas Introna — wherein I was involved has aimed at discussing the performative conditions of STS scholars’ research practices by drawing upon Karen Barad’s powerful concept of ‘ethico-onto-epistemology’ (Barad, 2007). These two happenings, therefore, have characterized my first experience at the 4S/EASST conference by sharing a common overarching inquiry: how do we (as junior and seasoned scholars) do STS studies “by other means”? Such tricky question brings up the ethical and political implications of epistemological and methodological practices, an issue that goes beyond the popular debates around reflexivity and representationalism in STS (Woolgar, 1988). The postgraduate workshop saw PhD students, postgraduate and early-career scholars engaged in discussions on how to do research by other means, that is to say how to account for our own research practices carried out outside of conventional academic borders (art, architecture, design) and how to disentangle the complex relationships between the researcher and the worlds they contribute to enact. This discussion brought to the fore the methological question of how to tell different stories, explore different ways of knowledge transmission, and what are the contexts that allow us to do research by other means, expanding the range of methods we already employ. A widespread criticism of the academic habitus (Bourdieu, 1988) combined with lively ideas on how to look at the future characterized the sessions on publishing practices and career opportunities. We discussed our experiences and challenges regarding writing research and publishing through conventional and unconventional channels. We discovered that many of us run or ran a blog to tease ideas out and that, in turn, such use of writing to shapes who we are as researchers. Some of us agree that traditional academic products — of which the conventional paper is the quintessence — and the system of peer-reviewing serve more to reproduce disciplinary standards of knowledge and conformity within the university rather than to bring about an effective impact on the world they assume to get to know. This concern nicely resonates with Geoffrey Bowker’s critique of the linear thinking and narrative conveyed by the scientific paper, whose data would often be known by the average citizen without doing any research (Bowker, 2014). The reluctance to conform with the academic habitus — “I don’t want to be an academic. I want to be a person who gets to work in academia” —, the encouragement not to compromise our interests and the way we do theory along with practical advices such as “learn how to write funding proposals” marked the concluding moments of the workshop. For someone like me, who was looking for new perspectives and motivations to pursue a career in research, the postgraduate meeting has been an inspiring experience not just for the stories, challenges, joys and concerns I shared with my peers (see Figure 1), but because the idea itself of organizing a pre-conference workshop in which to discuss an alternative set of logics and values has been a successful attempt to put those very alternative logics and values into practice (Erickson et al., 2016). With a reinvigorated spirit, I left the Hangar where the workshop was held to reach the International Convention Centre for the conference opening. I got to my track, scheduled throughout the last day of the conference, with the idea that the insights emerged during the workshop would have bounced back during the four sessions dedicated the discussion of the ethical, ontological and epistemological implications of STS research practices. After all, I tackled both the situations with the same concerns: to reflect on the ethico-onto-epistemic challenges of my doctoral research on the one hand, and to come across other research and researchers with whom I seemingly shared the same experiences and research interests. As hinted, the track invited contributions relating to the performative conditions of methods and methodology in STS, the entanglement of subjects and objects in research, the enactments performed by epistemic practices and their relationship with everyday practices. The papers presented had both theoretical and empirical orientations, and covered a wide range of topics: a theoretical discussion around a posthumanist in social sciences, the critical issues raised by autoethnographic accounts, the implications of praxiography, diffraction in practice and as practice, touching as method, ethico-onto-epistemological commitments of and for sociomaterial research, and the process of writing research as ethico-onto-epistemic practice. The concept of ‘ethico-onto-epistemology’ that inspired the track has been developed by Barad rejects the ontological separation between object of observation, instruments of observation and observer, to suggest that the materialization of reality depends on different entanglements between subjects, matter and meanings. This means that there is not a reality “out there” to be scrutinized and described, but ongoing (re)configurations of concepts, methods, human and non-human agencies. Drawing primarily upon Barad’s call for ethico-onto-epistemology, the track invited to appreciate the intertwinement of ethics, knowing and becoming that nurture any research enterprise by highlighting the generative and ontological character of methods. Considering this, the tracks aimed at exploring the ways we can perform STS “by other means”, actively and creatively participating in the enactment of the world trough research methods. 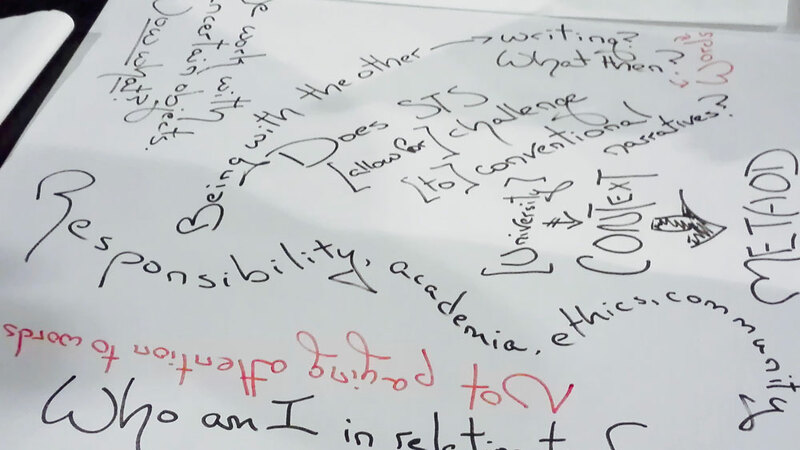 Similar concerns have inevitably challenged conventional forms of knowing, resonating with the critical issues teased out during the doctoral workshop. For example, Lisa Wood discussed the limits of the acceptability of the personal experience in research accounts by presenting both a traditional ethnographic and an autoethnographic account relating to medical visualization practices. Her argument pointed to the recurrent beliefs that consider autoethnography as lacking in rigor or as “sloppy sociology” by criteria such as ‘reliability’, ‘generalizability’ and ‘credibility’. This made me wonder: if hierarchies of knowledge still stand, what do they serve to? Who is interested in holding such perceptions of methods and why? This issue reminds me to what John Law has called ‘normativity of method’, that is to say the hegemonic pretensions of certain versions or accounts of method. It follows a call for a “slow, vulnerable, quiet, multiple, modest, uncertain, and diverse” method in social science (Law, 2004). Along similar lines, Eva Svedmark’s talk pointed to the case of doing “uncomfortable science” such as that of studying digital narratives and self-disclosure online practices related to suicide, self-harm, and mental illness. Drawing upon feminist tecnoscience and posthuman theory, Svedmark suggested touch as method within ethico-onto-epistemology. She explained how she got in touch with the research material through the body, emotions and technologies, a sociomaterial configuration that — Svedmark explained — enabled to articulate and enact phenomena rather than to capture data. In this respect, she drew on Donna Haraway’s work to emphasize the ethical challenges posed by “what stories make worlds and what worlds make stories” (Haraway, 2011), an argument that resonated quite interesting with postgraduate workshop’s remark about the need to tell different stories. Finally, I would like to mention Lucas Introna’s reflections on performative epistemic practices. Here, I am particularly interested in his stressing the importance of the adverb ‘seriously’ contained in the track’s pivotal question “What happens if we take Barad’s call for ethico-onto-epistemology seriously?”. The presence of this modifier is anything but trivial inasmuch as, according to Introna, we do not take alternative research practices seriously because we are into regimes of truth. As a matter of fact, he argued that there are many scholars in STS that claim to use the theoretical apparatus of the ontology of becoming, but still present their research methodology — collecting, ordering, and describing — and enact their epistemic practices in the language of the representational paradigm. When I raised a question about the power differentials between epistemic practices and research fields and the consequent difficult to conceive of and carry out alternative research practices, he acknowledged the issue, but still his claim was clear and simple: “the point is that we don’t do that. So let’s do it!